USAA Bank is the exclusive provider of credit card services for Norwich University Alumni Association. 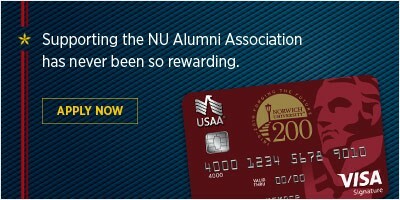 The NU Alumni Association USAA Rewards™ Visa Signature® Credit Card is now available to Norwich alumni, parents, faculty and staff. * Show your support for Norwich University each time you use your NUAA USAA Rewards credit card. * USAA Bank will make a contribution to the Norwich University Alumni Association for every credit card account opened and each time you make an eligible purchase with the card. * This card offers you great service, competitive interest rates and rewards points that you can redeem for your choice of gift cards, merchandise, travel discounts and other rewards. You can even redeem your points and donate back to the NUAA. Credit cards provided by USAA Savings Bank, Member FDIC. Norwich University Alumni Association receives financial support from USAA for this sponsorship. The content below is provided by USAA and includes articles, videos and online resources. USAA and the Institute for Veterans and Military Families (IVMF) released the fourth and final installment of its Workforce Readiness Research Series. The paper explores key factors supporting military financial readiness and presents tips on how service members can gain control over their finances before transition, improve their financial situation while in the military and reduce the risk of financial hardship when they enter into civilian life. Read the full paper here: Pathways to Opportunity: Financial Flexibility and Workforce Readiness. Being on your own for the first time and managing your money can be scary. Relax. You don’t have to be a Wall Street pro by the time you draw your first paycheck. Securing your mobile devices can reduce the likelihood of access to your personal and financial information, photos, texts and email if your device is lost or stolen. Learn ways to protect your devices and prevent threats from outside sources. Here are six ways to make the hand-me-down process more fun and effective. Miss USA Deshauna Barber is a U.S. Army reservist and the first service member to hold the title. Following sound money management principles can help reduce the impact and alleviate the stress associated with increasing rates. The USAA Member Community serves as the place for members to seek/give advice and tips around items that are most important in their lives. - 117th Army Nave Game - A report form USAA's "Media Row"
Facebook: As technology improves, so do the techniques that criminals use to mine our personal information. Find out what steps you can take to help safeguard your identity online. Facebook: Giving military families unique experiences - such as meeting 2015 Salute to Service winner Vincent Jackson and other Tampa Bay Buccaneers - is what our NFL military appreciation is all about. Next week we're in San Diego and Seattle. Keep watching for more pics and videos!